Singers are fortunate to have a traveling instrument requiring no special assembly or installation. Even so, it is helpful to understand the make-up of the singing apparatus. 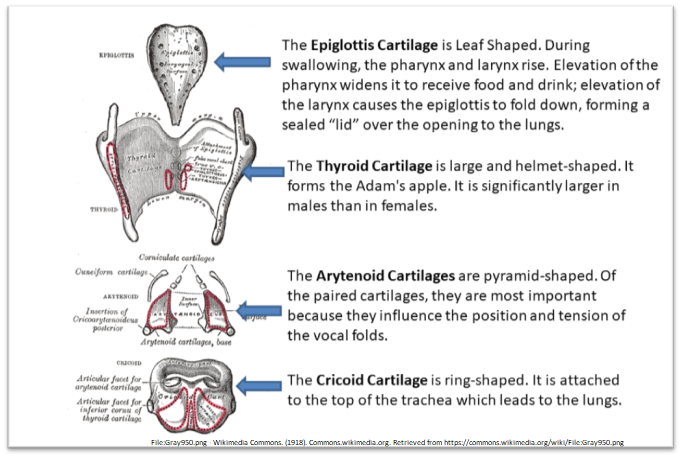 The larynx is the main structure of the human singing instrument. It is an organ suspended in the neck from the hyoid (the only bone in the larynx), and it is situated below the jaw in the neck. Its composition is primarily cartilage (seven cartilages total), tissue, membrane, and muscle. Because the main part of the larynx is in a state of suspension, it can make excursions up and down and side to side in the neck. For singing and speaking, the laryngeal structure tilts and vibrates. An interesting feature of the larynx is the epiglottis, which is a leaf-shaped flap of cartilage located behind the tongue at the top of the larynx. Its function is to seal the windpipe during swallowing so that food or saliva is not accidentally inhaled. Thus, the larynx is instrumental in the prevention of choking. Phonation is the sound of singing and speech which occurs from the oscillation of the vocal folds and resonance of the vocal tract. Singing and speaking require a combination of changes in position, tension and mass of the vocal folds. Vocal folds are composed of mucous membrane stretched horizontally across the top opening of the larynx. The folds are situated just below the pharyngeal tract and above where the tract splits into the trachea and the esophagus within the larynx. They are open for breathing and closed for swallowing, sealing the windpipe from food and liquid. 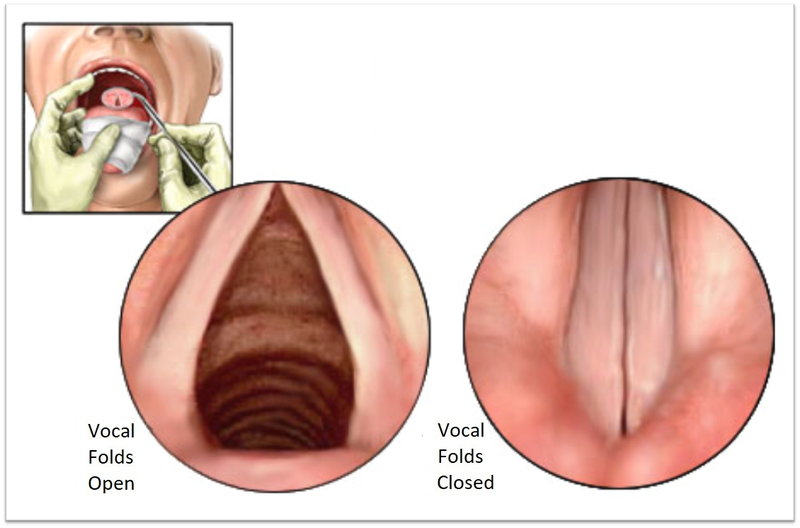 Vocal folds are essential for phonation or vocalization. Phonation requires the vibrate, modulating the flow of air being expelled from the lungs during phonation. The size of the folds affects voice pitch. Vocal folds begin growing to their full adult length and thickness during adolescence. Adult male vocal folds are relatively large and thick. Male vocal folds are between 0.75″ to 1.0″ in length. Female vocal folds are less dense and are between 0.5″ to 0.75″ in length. Gently place the fingers of one hand on one side of your neck/throat and then swallow. A swallow is a complex procedure involving numerous pairs of muscles. 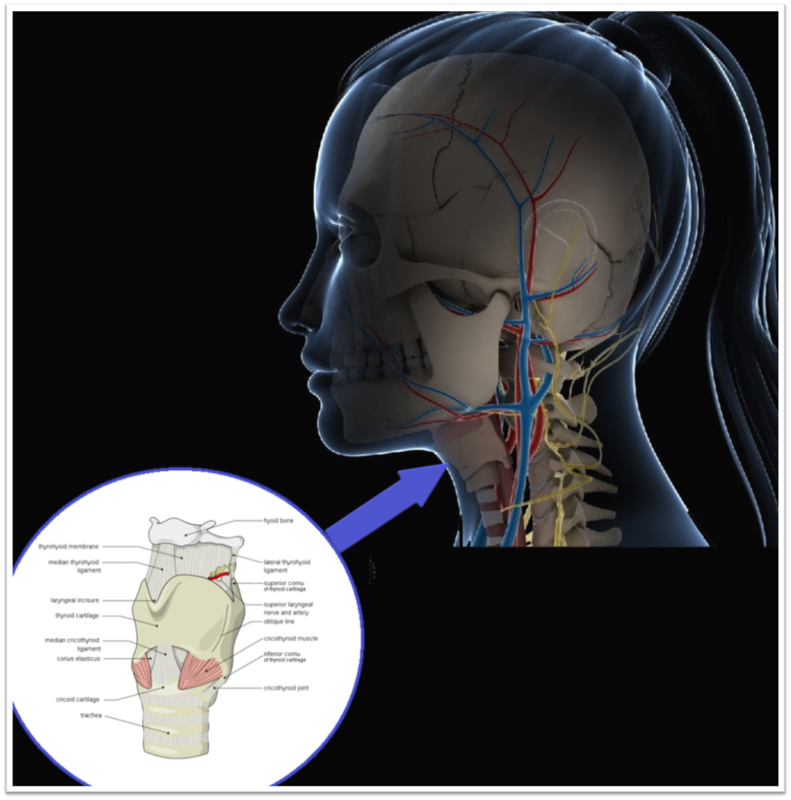 You probably noticed the larynx moving up then back down to a neutral position under your fingers as your tongue pushed saliva to the back of your mouth and down the throat. Gently place the fingers of your hand on one side of your throat and yawn. As the jaw descends and the tongue lowers for the yawn, you will notice the larynx move down. Gently place the fingers of your hand on one side of your throat and carefully nudge the larynx to one side. Repeat with the opposite side. Notice that the larynx can move slightly side to side. Gently place the fingers of your hand on one side of your throat while you hum. Notice the feeling of vibrations in your neck. Try touching around your lips, nose, jaw, skull and chest while you hum or sing throughout your vocal range. Notice the vibrations that are produced when you phonate. Simulate the opening and closing of your vocal folds: Beginning with your palms together as in figure ‘a,’ move your hands apart while inhaling (figure ‘b’). Now, sing a long tone as you bring your palms together. Each time you breathe, repeat the sequence, opening the palms for breath and closing for singing. Notice that the breath exhalation begins slightly before tone starts. Again, beginning palms together, breathe, opening your palms as in figure ‘b.’ Bringing palms together, sing an ee [i] vowel, starting from your lowest comfortable note. Perform a glissando to your highest comfortable note. As your voice slides from low to high, move your thumbs from a forward position (figure c) to an upright position. Move the thumbs back to the starting position as you slide your low voice down to your lowest comfortable note. The thumb movement simulates the lengthening and shortening action of the folds as you sing from low to high. Be sure to open your palms each time you take a breath and close your palms as you sing. Gently place the fingers of your hand on one side of your throat. Open your mouth as wide as possible. Notice the tension around your mouth, neck and jaw. Now, relax the opening until it feels natural and comfortable. Practice singing a range of vowel sounds with the jaw comfortably open. Gently place the fingers of your hand on one side of your throat. Make an expression of a dramatic frown and a dramatic grin. Notice the tension around your mouth, neck and jaw. Try rolling your shoulders to an extreme back position. Notice the tension around your neck. Relax to a neutral position. Experiment with a range of postures and expressions noticing any tension and exploring to find relaxation. Consider how tense postures might inhibit the ability of the larynx to move, tilt and vibrate while singing. Birch-Iensen, M., Borgström, P. S., & Ekberg, O. (1988). Cineradiography in closed and open pharyngeal swallow. Acta radiologica, 29(4), 407-410. Lumb, A. B. (2016). Nunn’s applied respiratory physiology eBook. Elsevier Health Sciences. Systems Physiology: From Molecule to Function (Vol. 3, No. 3, pp. 1-84). Morgan & Claypool Life Sciences. Trollinger, V. (2005). Performing arts medicine and music education: What do we really need to know?. Music Educators Journal, 92(2), 42-48. Zveglic, E. A. (2014). Speech and singing. In Recognizing and Treating Breathing Disorders (Second Edition) (pp. 203-214).